Plan a trip to the Greatest Indian Thar Desert, for a undoubtedly true Rajasthani Experience ! Unlike the regular crowd exploring the other popular destinations of Rajasthan like, Jaipur, Jaisalmer, Udaipur and other places, a trip to the Deserts and the nearby villages will be an experience close to your heart. Drive through the villages in the desert where you can get greeted by the curious onlookers for a hearty conversation. Visit their huts which has the perfect implementation of the Minimalist theory, living with things which are truly required for a livelihood in a desert. There are also facilities for tented camps to stay back in the night to enjoy the aloof beauty of the deserts and to mingle with the local residents of the villages participating in their cultural programmes. It is undoubtedly divine to taste the home made food items during your trip to any part of India. The delicacies embraced with the original recipes of Rajasthan are found in the villages of Thar desert. The hospitality is so heartening that you are afraid to extend your stay in the desert for few more days. You can explore the different regions of the desert sitting on the back of the camel, not a fun ride, a real ride going through the ups and downs of the sand dunes at least for a minimum of three hours. Crossing through the barren lands and the huts scattered here and there, is entirely a different experience reminding you of the busiest streets packed with all kinds of vehicles in your home land. 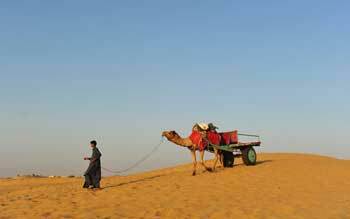 India lives in its diversity and you can experience this during your tour to the different regions of India and Thar Desert offers you an unusual experience , still unique ! !